Imfolozi The Primitive Trails The Real Safari Experance ! Experience, Imfolozi The Primitive Guided Walking Safari. In the heartland of one of Africa’s oldest game reserves. You can sense a grazing rhino, hear and feel the night air throb to the roar of lions intruding over the crackle of your campfire, Experience the bush at a very personal level. Ezemvelo KZN Wildlife offers trails over weekends or longer, designed to meet your time constraints while still allowing you to benefit fully from the experience. Folks who have done a trail come back for more, while first-timers will thrill to the sights, sounds and smells of the iMfolozi bush as never before. I encourage guests to leave watches and cell phones behind to experience greater freedom from time and deadline constraints. The trails, guided by armed game rangers and experienced guides who will add to your experience and knowledge, the iMfolozi Wilderness Trails can be a life-changing experience. Imfolozi Game Park, Aims this primitive wilderness walking safari to the outdoors enthusiast who would like to go into the African bush and encounter wildlife, backpacking and sleeping out under the stars. This trail can accommodate a maximum of eight and must have a minimum of six confirmed bookings to take place. The Hluhluwe-Imfolozi Game Park designed the trail to offer a basic wilderness living experience like old explorer days of African Fronter. With the least amount of equipment. Water is collected, from springs or rivers in the wilderness area. Bathing is done, in the river wherever possible. An important part of the trek is spending time alone on watch at the fire at night. You will, get to embrace the silence and solitude. Qualities difficult to find in today’s world. It requires trailers to leave their watches and cell phones behind to experience greater freedom from time constraints and deadlines. The trail is all inclusive- all equipment (including first aid kit), Imfolozi provides bedding and food. (, no special diets can be catered for). This safari, requires trailers to aid with food preparation and camp duties. Please note that there are no ablutions and showers on this trail they will show you how to use the bush toilets LOL. After booking in at Mpila Resort by 09:00 on the day of departure, trailers met by the Wilderness Trails staff who will advise them on how best to pack their backpacks. After a late breakfast and a briefing, trailers set off into the Wilderness area, where they will spend four nights and four full days, accompanied by a Trails Officer and a Field Guide. The trail ends at Mdindini Base Camp at 10:00 on the last day. Four nights are spent out in the bush, camping wherever the Trails Officer finds a suitable spot. Camping follows a very strict 'minimum impact, no trace' ethic, which is in line with wilderness principles. Guides set small camps up at night, with clients sleeping under the stars around a small fire, after enjoying a meal prepared by the Trails Officer, the Field Guide, and trialist. Guides provide a lightweight rain shelter in case of bad weather. Distances covered each day are not excessive due to the need to carry all the equipment. Backpacks, sometimes left at a campsite, and day walks taken to explore the wilderness area in relative freedom. 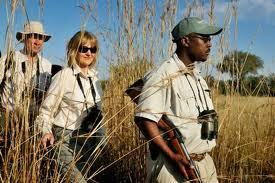 The Primitive Safari trails are conducted from mid-February to mid-November. It is essential you make certain you know what to expect before you book a primitive trail. On arrival, check-in Mpila Resort reception to register, after which you will be directed to the trails officer. It is important to arrive by 09:00 on the date showed on the reservation voucher, to allow time to pack, walk into the Wilderness Area and make camp before dark. • Toilet trowel, paper etc. NB: It is imperative that you wear a comfortable pair of hiking boots, which are well worn in. Ezemvelo KZN Wildlife will supply all equipment and provide all food for meals. You may bring your own equipment as long as it blends into the bush environment. You may bring your own additional snacks and drinks should you feel it necessary. You can bring A little alcohol, into the wilderness area, however, No excessive drinking, for reasons of safety, and to avoid detracting from the wilderness ethic, which involves quietly blending in with the environment. A good guideline is to keep within the legal alcohol limit for driving a vehicle. Should Hikers insist on excessive drinking, the walks will proceed no further than one kilometer from the base camp or wilderness camp, depending on the trail. Remember that you will have to carry your own alcohol for four days.